The brand-new posters for the 2007 Anti-Death Penalty Alternative Spring Break are printed and should be appearing on campuses around Texas soon. The spring break is being organized by Texas Students Against the Death Penalty, which writes about it on their blog. 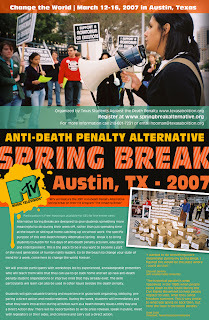 The Anti-Death Penalty Alternative Spring Break is March 12-16 in Austin. Shout out to Shannon Dudley of Inkblot Creative in California for the great poster design. Thanks, Shannon!